Finally Prabhupada's quarters at 7 Bury Place were complete, and he moved in, just as the autumn weather began to grow cold in London. Many of my fondest memories are my walks with Srila Prabhupada on those frosty mornings. As I was a leader of the London Temple, I made sure that each devotee got an opportunity to share a morning walk with Prabhupada and, of course, I frequently scheduled myself as well. However, one morning I thought I should stay behind and give one other devotee a chance to walk with Prabhupada. As Prabhupada was coming down the stairs from the second floor of Bury Place, I was vacillating in my mind whether to go with him or stay. As if reading my mind, Srila Prabhupada paused and asked me, "Are you not going on the walk?" I quickly changed my mind, timidly answering, "Yes." Then he said, "Thank you very much." One afternoon, as i was walking through the streets of London, I noticed the struggle and squalor and started reflecting on injustice, wars, starvation, and prejudice in the material world -and beame sad. I wen to Prabhupada's room and remarked to him, "Sometimes I feel sad for humanity." Dr. Joe Burke was a well-known psychiatrist in London, a colleague of Dr. Ronnie Laing, who gained notoriety for his work with schizophrenics. 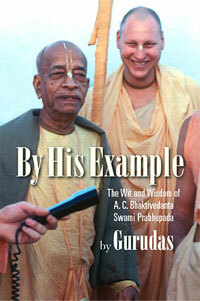 He became a friend of mine, and one day I mentioned that he might enjoy meeting Prabhupada. He readily agreed. I picked him up at his office in the Krishna Van. When one of his staff asked him where he was going, Dr. Burke answered, "I am going to see my psychiatrist." Many times while I was riding or walking with Prabhupada, he would look at the building or a plot of land and inquire as to its use. "What is that building? he would ask, pointing with his cane. It was if Prabhupada wanted to slowly offer a whole city to Krishna, piece by piece. One day, in his usual manner, he pointed to a large building with a FOR HIRE OR SALE sign in front. The building was five stories high and took up two corners in central London, eight on Shaftsbury Avenue. Prabhupada asked me to inquire further into its zoning and usage. The real estate informed me that the building was once used by the YMCA before they moved to their present headquarters on Great Russel Street. I procured the keys, and Srila Prabhupada and I walked over from the Bury Street temple to see the inside of the buiding. I felt good, basking in the golden glow of my mentor, as we strolled past the public baths and the Shaftsbury Theater (which was showing the play Hair) and crossed over to Endell Street where the main door was located. The lock was old and rusty, and it took some strength to turn the key. Prabhupada patently stood by my side. By Krishna's grace the lock opened, and the double-door parted. We looked at the large main foyer, and I could feel Prabhupada's mind making plans. We walked into a basketball court/ gymnasium, and we both knew that this would be the temple room. I could just imagine an altar replacing the hoop at the far end of the gym. We examined the lockers and bathrooms. The fixtures were old, and so as I pointed out some cracks in the wall, Prabhupada acknowledged them. We had been through this before. In San Francisco, while looking at an old church on 14th Streeet, Ptrabhupada had showed me how to look for cracks, leaks, termites, and so on. By now I knew what to look for while inspecting buildings. There was a decaying kitchen that could be repaired. We walked up one of the wide stairways and surveyed the second floor. The rooms were large. There was plenty of room here for a magnificent temple. I ran up the stairs to the third and fourth floors and saw that they basically were the same design as the second. I ran back down the stairs to report this to Prabhupada so that he did not have to climb the stairs himself. Prabhupada wanted to inspect the basement. Debris that had gathered around the bottom of the basement door was loosened, and bit by bit the the rstsy door swung open. Slowly, I descended the stairs, with Prabhupada following close behind me. As we alighted onto the basement floor, he stuck even closer to my side. I felt like we were two kids exploring an empty house. The basement was one huge room with many pillars supporting the ceiling. Suddenly, the few light bulbs sputtered, dimmed, and extinguished, leaving Prabhupada and me in total darkness. I felt his hand clutch the cloth of my kurta, and I reached out to him. I was simultaneously scared and elated by this intimate proximity to my spiritual master. I then felt his hand touch mine. He took my hand, and we held hands as we groped around in the dark. My nose was filled with his pleasant, comforting, sandalwood scent. I knew that for us to separate would be futile. We were standing together and were safe in each others' presence. I heard him chanting, "Hare Krishna, Hare Krishna, Krishna Krishna, Hare Hare..."
I felt the strong desire to protect my Guru Maharaj. He was always protecting me, maybe I could repay him! With my other hand I felt for the wall, but felt nothing but air. We took small, slow steps towards the stairs. Finally, my hand felt through the surface of the wall. We inched our way along the wall, walking a rajor's edge between standing and falling. I whispered to Srila Prabhupada, "We are coming closer to the stairs." I felt calm, even with electricity coming from Srila Prabhupada's lotus hand into mine. My foot hit the base of the stairs and said, "We are at the stairs." Very carefully, I lifted my foot and found the first step. I took each step slowly. Prabhupada was still holding onto me, and he followed as I ascended. As we got closer to the top of the stairs, we could see light filtering in through the doorway. When we reached the ground floor, we saw that the lights were also on that floor. Prabhupada was smiling and calm but still holding my hand. I wanted to remain that way forever. Then Prabhupada looked around and ssid, "This building is not suitable. There is too much to repair." Then almost imperceptibly, he let go of my hand. I didn't wash my hand for a week and basked in the afterglo of our bonding experience.